You eat with your eyes first? I also love to eat with my hands: I am happy with raw fruit, veggie sticks and dips, granola bars, handy pieces of cake, and messy BBQs. I don't mind getting my hands dirty when eating. It's another sensation to actually touch the food that you are about to eat. In Dubai, there is a whole-in-the wall- fish restaurant near a fishing village, right on the beach. It's basically just a porta-cabin with a kitchen inside. They serve the catch of the day (in all sizes), marinated and shallow-fried. There is no menu, no phone number. Wobbly, old plastic tables and chairs will be put up in the sandy patch in front of the porta-cabin as guests arrive. You choose your fish from the tub where the marinated, uncooked ones are being kept. Additionally, there is flat bread and some curry sauce. The cooked fish is being brought on large trays, plus a pile of plates and a roll of paper kitchen towels. That's all. No cutlery. A true experience, as everyone around the table is tucking into the same fish, pulling off lovely pieces of the freshest fish possible, cooked to perfection, in a no-fuss way. 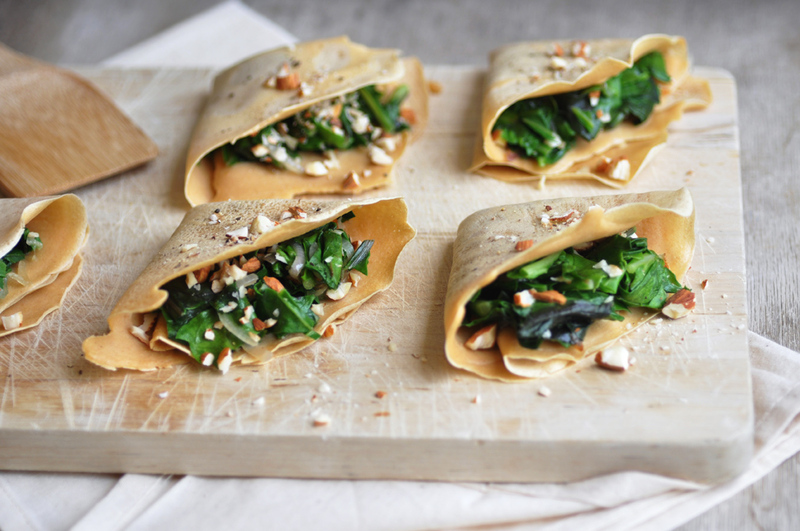 These spinach-filled crepes are finger food too. They were inspired (pretty much by the picture and the lovely presentation) by a recipe from Citron Et Vanille. I changed the filling as I only had spinach on hand. The bitter green leaves work beautifully with the sweet onions. The roasted almonds add some crunchy texture. The crepes themselves have this lovely flavor of chickpeas. I am addicted to it. Folding it into little filled pockets make it a perfect finger food. A light lunch, healthy through and through. Bon appetit! In a bowl, combine flours and salt. In a separate bowl whisk the egg. Stir in olive oil and milk. Combine egg mixture with flour mixture. Add water in small amounts until the batter is runny. Let sit for 10 minutes. In a dry pan, roast the almonds for 5 minutes over low heat. Let cool, then finely chop. Set aside. In a pan, heat the olive oil over medium heat. Fry the onions, until softened. Add garlic. Keep frying until onions start to to brown. Add spinach and cook until just wilted. Season with salt and freshly ground pepper. Heat a lightly greased non-stick pan over medium heat. Pour some of the batter, move the pan around immediately to ensure even spreading in thin layer. Flip over when bottom side is cooked, about 2 minutes. Then cook for another minute. Transfer crepe to a plate. 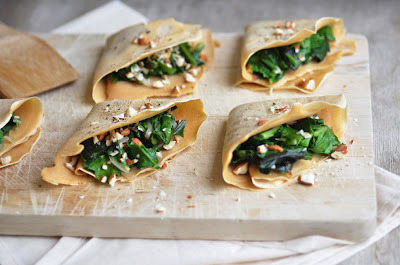 Place 1-2 tablespoons of the spinach filling on one quarter of the crepe. Sprinkle with chopped almonds. Fold over the crepe horizontally and vertically, so you'll get a triangle and the the spinach will sit in a pocket. Repeat with remaining batter and filling. Sprinkle each crepe triangle with freshly ground pepper. Serve immediately.